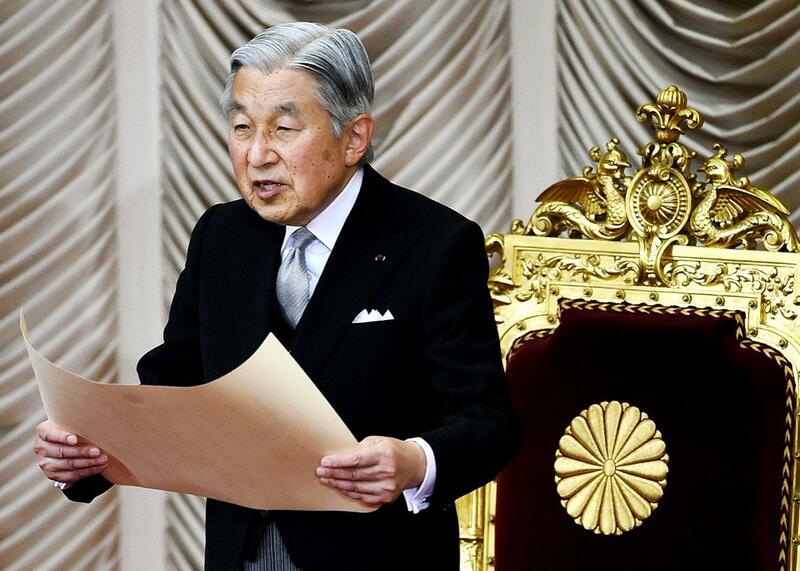 Will the Japanese Akihito be allowed to abdicate? What Does the Japanese Emperor Do? And will Japan let him stop doing it? Japanese Emperor Akihito delivers his opening address for the extraordinary Diet session at the National Diet in Tokyo on Aug. 1, 2016. On Monday, the Japanese emperor, Akihito, spoke to the nation in a televised speech and made clear that, at 82, he wants to step down. His role is largely ceremonial, but the decision to retire would require parliament to act, as there is no legal mechanism by which an emperor can abdicate. The issue has arisen at a time in which the conservative Japanese Prime Minister, Shinzo Abe, wants to amend the country’s pacifist constitution, the current form of which Akihito sees himself as defending. To discuss this development, I spoke by phone with Carol Gluck, a professor of Japanese history at Columbia University. During the course of our conversation, which has been edited and condensed for clarity, we covered the strange history of Japan’s imperial line, America’s hand in Japanese imperial politics, and the emperor’s role in how Japan remembers World War II. Isaac Chotiner: Why is this such an important story in Japan, given that the emperor doesn’t hold any real political power? Carol Gluck: It is a big deal in Japan. There are three big reasons. The first is that the imperial institution of the Japanese emperor was built into the center of Japanese national identity when it became a modern state in 1868. They used a mythology that went back to the Sun Goddess and the founding of Japan in 660 B.C., which is all mythology. The emperor is a focal point of national identity: a long line, unbroken, for ages eternal. The second reason: There have been four modern emperors. There was a modernizing emperor, under which Japan modernized in the late 19th century. And then a very short-lived emperor from 1912-1926. And then the very long reign of the third emperor, which began at the end of 1926, and lasted until the first week of 1989. * This is Hirohito. Because the war was fought in his name, the name of a divine emperor, and with an image of him in a military uniform on a horse, he is a big deal. The third reason is that instead of retiring him from the throne, and/or abolishing the imperial institution, the Americans thought it would be a good idea to keep the emperor in place. This was not something that any other country in the world wanted. The other allies wanted to string him up. But the Americans thought, The Japanese follow their emperor. They believe in their emperor. We better keep him in order to make Japan peaceful and democratic. This is a big thing: to reform the country from the bottom up but keep the top there. Which is amazing, given the way Japan was in fact reformed in so many real ways. Exactly. They kept him on the throne, but they wrote the Japanese Constitution, which is a big issue in Japan and a big issue for this emperor. The Americans said that the emperor was the symbol of the state and the unity of the people. He had no relation to politics. They transformed it constitutionally—because in the old constitution, the emperor was commander-in-chief. They took him out of his uniform, they took him down from the white horse, and they put a black Western-style suit and homburg hat on him, and had him do these walkabouts to be with the people. It was amusing because he had never talked to them. Nonetheless, that same man reigned until 1989. How has the current emperor performed this role? The reason this today is such a big deal is that this emperor is the first emperor who has actually transformed the institution by performing his role as the symbol of the people. He has actually changed the performance of the role. He has changed it in accordance with the constitution, which he always mentions. He stays completely away from politics, and is utterly prudent and cautious about the constitutional fulfillment of his duties. And I think this is the most important thing: He has used his role to do things symbolically that the government never did. He has made statements about war memory repeatedly. When he mourns the war dead, he says that Japan must never forget what we did to your country, whether it is the Philippines or Palau. He even said that Japan had to remember the war starting with the [Japanese invasion of] Manchuria in 1931. They never start the war there. He did things for the polity in terms of war memory that the government has refused to do. Pretty impressive. You said he wasn’t political, but this seems very political, especially when the current prime minister of Japan does not express these sentiments as often or as fulsomely as people, especially outside of Japan, would like. It is political in one sense but not in the sense that the constitution forbids. It is political in the way that Willy Brandt’s kneeling at the Warsaw Ghetto Memorial was. There was a lot of politics in that, but it was symbolic. But when your message is one of peace and apology, it is like kneeling. It is not political in terms of mixing in with governments or policy. This emperor has virtually said to the right wing, in the early 1990s, “I am not your emperor. Don’t use me.” He didn’t say that specifically, but he led people to believe by his consistent remarks that he was not the emperor that the right wing was talking about. He was the one who acknowledged the Korean origins of the imperial house. That was absolutely taboo. Fact, but taboo. What are the connections between what Akihito said on Monday and Abe’s attempts to amend the constitution? The connection is very interesting because in fact this particular regime doesn’t feel about the constitution the way that the emperor does. The emperor repeatedly evokes the constitution. And that does have a political valence. He says he supports the peace constitution and is trying to live up to it. It definitely puts Abe in a harder spot, because he is a nationalist, and the right wing of his party—many of them are emperorists: “The imperial institution is the heart of our identity” and stuff like that. The emperor himself has been consistent over the years, but the meaning of it is different when you have a regime which is as conservative and nationalist as this prime minister. What do the Japanese people make of the current emperor? They think he is fine. They don’t think he is important. He doesn’t impinge on their lives. He has normalized, or monarchized, if I can make up a word right now, the Japanese emperor. Now they look more like the European ones, even if they aren’t riding around on bicycles. That occurred during his reign and is his legacy. He is not even a monarch like Elizabeth II, where a lot of people in Britain would like to get rid of her. It’s like the monarch in Denmark or Belgium. They are happy with their king and he doesn’t do much. He has very high approval ratings. He is not going to be allowed to abdicate. It is not going to happen that way. They are not going to be able to change the law. They don’t do things like that in Japan. Change is slow, for reasons people like. The right wing is worried that if they change the law it will bring up the question of whether a woman can be emperor. So now we have to watch and see what kind of workaround they are going to find. They have already reduced his number of events. I give this emperor a lot of credit for making them figure this out, because he is asking in a very human and humane way to do the right thing. The government has a political and legal dilemma. Will this issue have consequences for Japanese politics? It may make it more difficult for the Abe government to do the kinds of constitutional things that they want to. It may or may not. But if it does have an impact it will be in the direction of preserving the pacifist constitution. Which is a giant historical irony, right? Yes. Well, what is an emperor doing in a 21st-century democracy anyway? The answer is that he shouldn’t have been there. But he is there. And it is to his credit that he has made it a democratic monarchy, basically. It’s not going to change politics, but it is going to at least shade it in a direction that isn’t the one Abe and the conservatives would like.